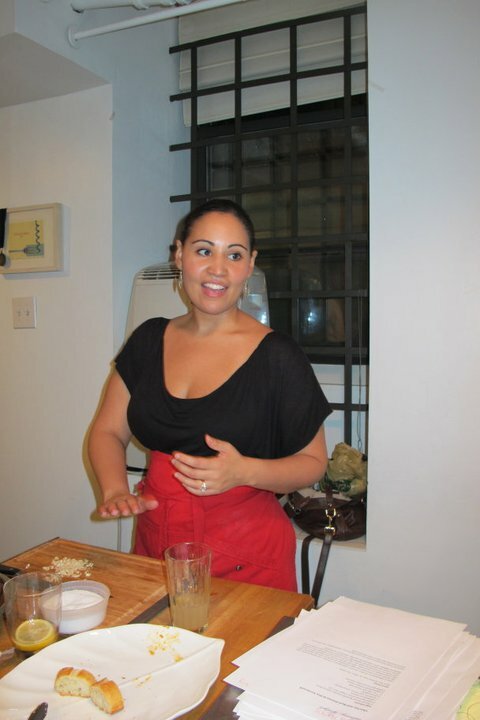 Last Thursday I hosted the first of my summer cooking class series. It was SO MUCH FUN! The class was such a blast, with a group of 7 students including one adorable and very precocious 10-year-old. The theme for this class was "Seasonal Spanish Tapas," and under my instruction, the students made (and ate!) a full menu of classic Spanish tapas dishes with a Summery, seasonal twist. We made grass-fed beef meatballs with a spicy herbed-tomato sauce, chorizo and red onions cooked in dry vermouth, bacon-wrapped apricots stuffed with an almond-sage stuffing, chorizo-chocolate-saffron crostini (yes, sir! ), roasted plums in spiced honey with fresh ricotta, red wine cherry compote (served with salty cream cheese), grilled pan con tomate topped with fresh tomato and just a hint of sea salt, and black pepper asparagus with homemade garlic aioli (that we whipped up completely by hand!). I also made a couple of pitchers of sangria--a white sangria with fresh nectarines and guava nectar, and a red sangria with oranges, cherry bitters, and a medley of fresh berries. I also taught our youngest student how to make herself a pitcher of virgin "sangria" so she could join in on the fun! 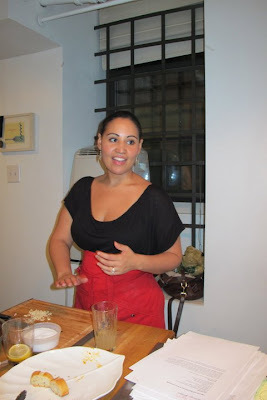 It really was such a fun time cooking and sharing in the gorgeous professional kitchen, with everyone pitching in to put together a wonderful meal, and I was happy to learn that the students all left with full bellies and lots of new cooking techniques and recipes. Here are a few pictures for you to check out (there are also more on my Facebook page). The gorgeous professional kitchen in Midtown West where the classes take place. Each student gets his/her own work station complete with a cutting board, chef's knife, apron, towel, and recipe booklet. I assign each student a recipe to be in charge of, though we end up working on everything together. You are never too young (or too old!) to learn how to cook! In this class we made aioli by hand from scratch. Here, a student takes a turn with the whisk. Teaching how to create a smooth garlic paste on the cutting board as a base for aioli and vinaigrette. After cooking, we sit back and relax, enjoying the meal we made. New to Always Order Dessert? Let's connect so you can find out the next time I post! Follow me on Twitter, Instagram, or Pinterest, become a fan on Facebook, or sign up to receive my once-a-week e-mail updates.